Are you looking forward to the warmer weather and longer days at the barn? Well, you’re not the only one. Flies are awaiting their favorite time of year, when they get to make your barn & sheds their new summer vacation home. Specifically, a horse fly can ruin your day with your animals as they aggressively seek their blood meal for the day. Don’t let the flies take over your facility or livestock! There are many options to get them to BUZZ OFF! Manure Management – Muck out stalls DAILY, especially in the summer. Where is your manure pile? Make sure it is not close to the barn or where your animals are grazing during the day. 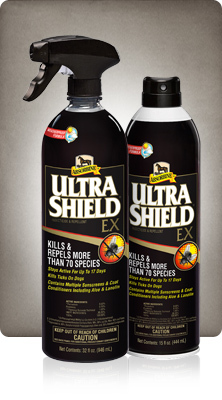 Fly Repellent– Spray your livestock daily, especially after you bathe or rinse your animal. Make sure you remove excess water after bathing before spraying fly repellent. Fly Masks & Sheets– Great for keeping the flies from aggravating their ears and eyes (especially if they are goopy). Fly sheets are also beneficial to keep the flies from biting around their shoulders and neck. Fly Spray Systems– Install an insect control spraying system in your barn that automatically sprays throughout the day preventing flies even when you are not at the barn. Lochte Feed & General Store has a variety of fly control products to help you keep your animals healthy and happy! This entry was posted on Tuesday, June 13th, 2017 at 1:43 pm	and is filed under News & Updates. You can follow any responses to this entry through the RSS 2.0 feed. Both comments and pings are currently closed.